I read Cocktailwonk`s post earlier on this rum where i read the flavor description by Bryan – “chocolate-dipped plums rolled in espresso powder.” That made my mouth water….Now having tried it for myself i find that the description is quite on point. This rum caught me by total surprise too…since i was expecting the Cuban Inspired Anejo Blanco rum to be launched and instead they launch this…albeit it´s a collaboration with Bounty Hunter Wine and Spirits in a very small batch – 225 bottles – and only sold at the Bounty Hunter thus only being available to people in the US and during a short time. 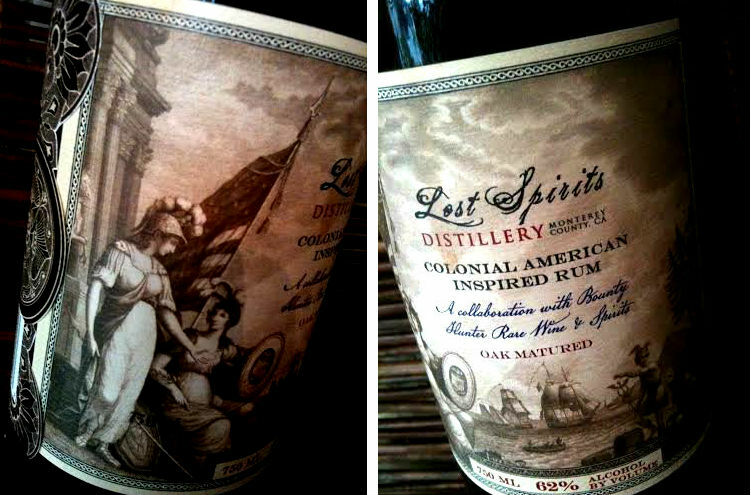 It does have a different price tag than the other Lost Spirit rums, (a whopping $100 instead of $45) due to the tiny production. I see this rum as an indication of what`s to come because they are continuously developing their rums, experimenting with ways to improve them and reach new levels and what they are doing is total geekery. I wouldn`t be surprised if they come out with a couple more of these type of small batch rums and i`m very interested to see where their rum developments takes them. 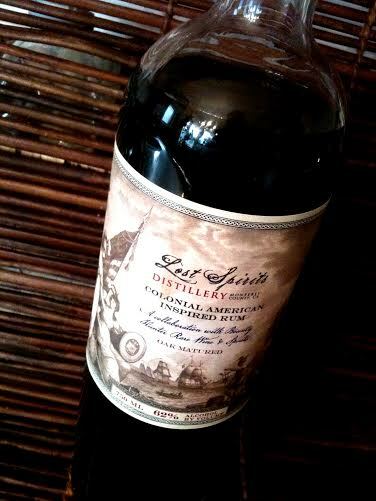 I really like the Colonial Inspired rum, the dark coffee notes are subtle but noticeable. There`s also hints of wood, sarsaparilla and vanilla in it. 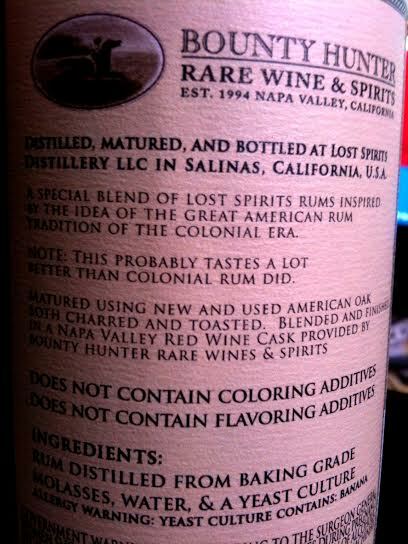 I like the fact that it`s made without any color or flavor additives, no extra sugar in this rum! just baking grade molasses, water and yeast culture. The nose to me is tropical fruit, citrus peel and spices and in the mouth you get an initial burn, the rum packs a 62% punch after all, then mature tropical fruit notes, sugarcane, wood, sarsaparilla, dark plums and a hint of coffee. It`s a strong dark rum and perfect for tiki drinks….just like the others they have made. Also the label made by Bryan is truly stunning, and like the previous labels – really detailed and artistic, reflecting the flavor profile of the rum. To chime in and offer my own answer (which is actually a lot less important than yours). Most rum companies have been around for a long time. They don’t inherently create new products. They continue to make what they have always made and what their customers expect from them. There is nothing wrong with this. In fact when you have 100 employees to feed it’s essential to your survival and your community. However, as a tiny new company (three people total) we have no such history. This freedom allows us to be super creative. Our engineering capability also lets us (to some extent) make what we can dream up. In fact we actually make the labels before we design the rum that goes in the bottle. This was inspired by watching pirates of the Caribbean over and over again while asking ourselves the question: what would that rum in the movie taste like if it were a real thing. We engineered this one to have a significant wood smoke note to evoke the cannon fire and gun smoke with a tar esque quality reminiscent of wooden ships. Sort of an islay whiskey meets rum idea while still staying pretty close to classic navy rum. Here we asked the question, if tiki was an actual place what would the rum taste like? We tried to make the chemical profile of the rum as close to that of a pineapple as possible. Tricky because we make rum not pineapples so it kept wanting to taste like rum not a pineapple. Geeky summary: Heavy pot still rum with a big mid palette of carboxylic esters (fruity flavors) and minimal phenolic & semi-volatile influence. Designed to float on tiki drinks. Here my dad was reminiscing about how good rum was when he was young (he is very old). So we wondered what the legendary cuban rum of 100 years ago was like. Since I don’t own any of that – I just let my imagination go. The idea here was to do a high rectification (read Spanish style rum) but in a pot still like they would have a LONG time ago. Then we designed the oak component to punch up the vanilla and accentuate the butterscotch notes of the white rum. Geeky summary: Lighter base rum with a massive vanilla profile created from careful phenol management in the oak. This one was a personal challenge. The commissioning party wanted a rum that could command the high price tag. For me this was the hardest project to date, because it meant it had to stand against my favorite rums (which are old). So for this one I actually used a prototype of a set of new techniques that I have been working on in the shop for a long time. I actually had to file patents before I could sell the bottles or give the buyers samples. It was very kind of them to put that kind of faith in me. Think of this one as a sneak preview of whats to come. Also here´s a link to a post by Cocktailwonk if you`re into the more technical details about this rum and I think it´s necessary to understand how this rum is made, so here is a link and one other to earlier posts and one new because this is not a rum made the conventional way, it´s just simply different and even though I`ve had no problems sipping their rums I do prefer to mix with them. 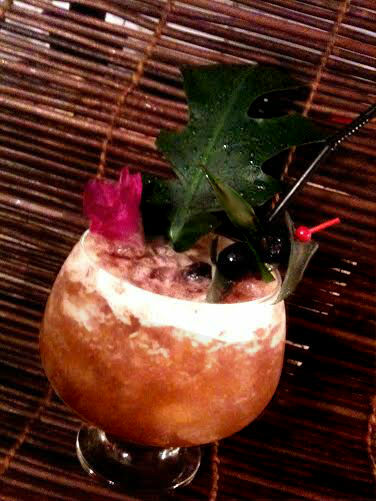 This is a drink obviously (if you`re into tiki) inspired by the Black Magic and the Dark Magic drinks…the Dark Magic created by Colonel Tiki in 2010 was in turn inspired by Mai Kai`s Black Magic. Blend ingredients with 8oz ice and pour into a crushed ice filled snifter and garnish with tropical orchids and leaves and 3 speared maraschino cherries. As this rum is hard to get and if you can`t find it, sub with the Lost Spirits Navy style rum. The taste of the drink i found to be spicy and strong and “tiki” as in a dark mysterious tiki bar. Let`s escape! 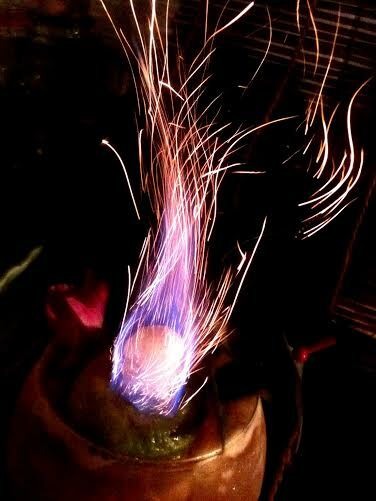 lower the lights and set that drink on fire…..
With this Lost Spirits rum here it becomes the Lost Pilot! The big difference from the Jet and Test Pilots is that while they use multiple rums this uses only the Colonial and the reason i only use one rum in this drink is that i wanted to see how this bold flavorful rum would do all by itself in this drink. Since i haven`t yet experimented with blending it with other rums i cannot say if that would make a tastier drink – and i certainly don`t try to duplicate the Mai Kai version (which btw contains four rums and some other things) and of course using several rums brings more depth but i do think that the rum is doing really well and that this version is tasty. Throw everything into the blender, ice last. Flash-blend for less than 5 seconds. 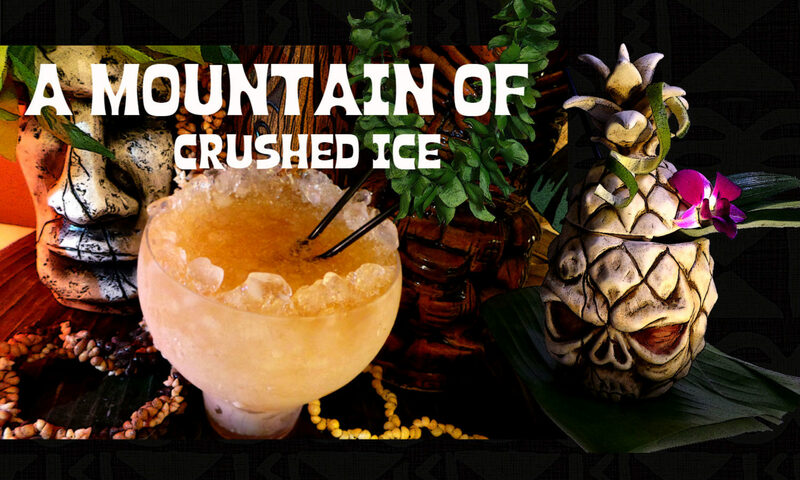 Pour into a glass or tiki mug filled with crushed ice. 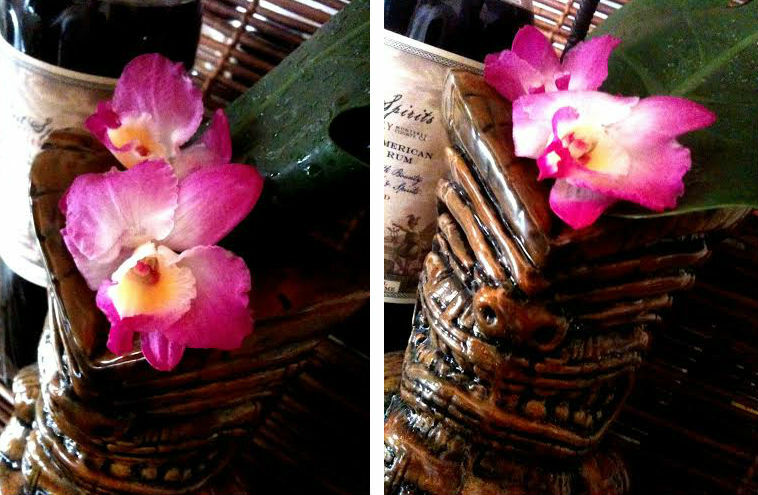 Garnish with a tropical orchid and leaf. 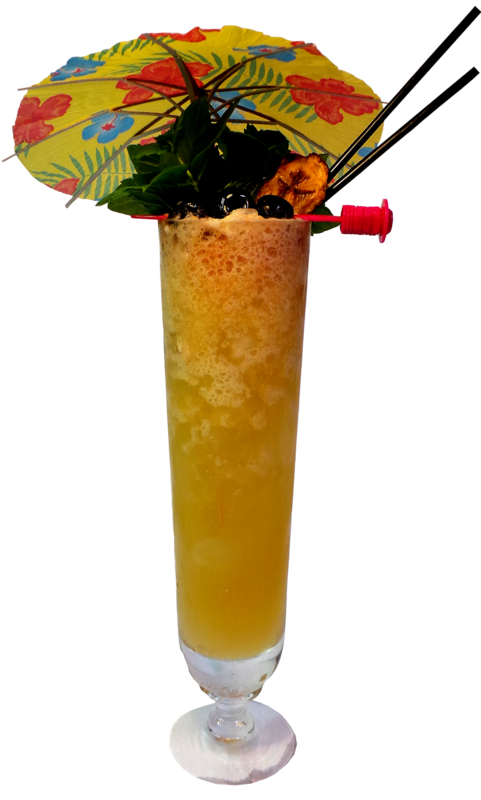 This is another strong and spicy tiki drink to help you escape into the eternal bliss of tropical fantasy island…. This cool tiki mug is the result of a collaboration between the good folks at The Floating Rum Shack and Cheeky Tiki. 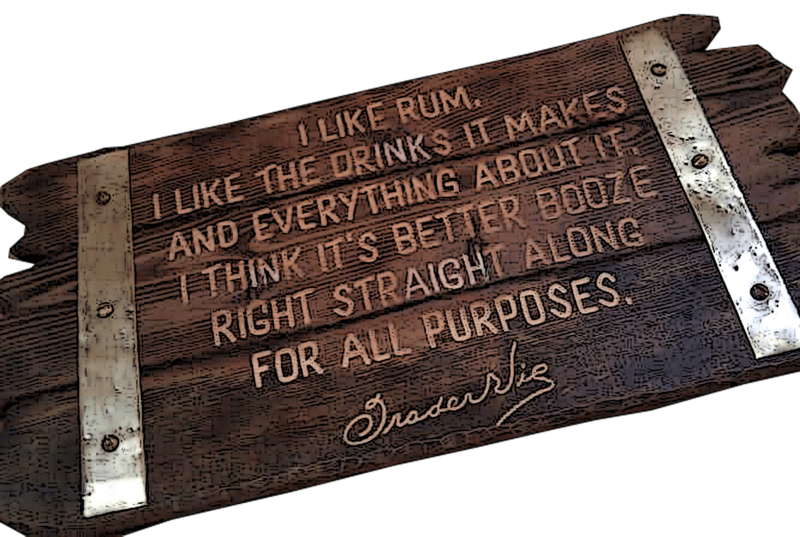 I wish there was more made of the Colonial American Inspired Rum…..I like the full flavor, the in your face punch and the potent strength, coffee notes and all and wish it was more widely available…I count myself very lucky to have a bottle. I`m looking forward to see what they gonna make in the future. If you happen to live in the US and can order from the Bounty Hunters Wine and Spirits you have a chance to get a bottle before they gone, only 225 bottles were made. Flavorful, strong, and quite a different animal…and so well suited for the type of drinks I love the most…this is all about big, bold flavours. Thanks Winnie! yeah i`m very interested in trying that rum! Thought this may be of interest to you. I love your site! I don’t have problems with them to sip it neat…but I love the strong rums so much!!! Laurent, i prefer to use them in drinks due to their strength but i have no problems sipping them, let´s say if you like strong rums neat then you`ll most likely like these rums. Thanks Helena for this new article. I’d like so much to try this one (and the previous ones!) but it seems near to impossible to get my hand on it here in France. Would you say it is more of a sipping rum or a mixing rum? Or rather (since you mix all types of rum ;)), since I am rather drinking my rum neat, would this one be good for me?